I grew up in several different places, but spent most of my childhood growing up in Panama City, Florida. When I was 12, I moved in with my father, and we moved to Sugarland Texas. From there, we moved to Little Rock Arkansas. The places I grew up really didn't influence me that much, but the people who I grew up around definitely shaped me. I got my first set of tattoos the day I turned 18. My dad left me some money because he was out of town, his exact words were "Don't spend this on a tattoo." I technically listened, because I got more then one. They were the crosses and names on my back. They are for my two grandfathers, who are the biggest influences on my life next to my parents. When I first got them, I went to a cheap studio, and they came out looking like tattoos that were drawn by a twelve year old, so for my birthday present, my aunt had them covered up by the two crosses you see today. I really don't have a set style. It all depends on my mood. I can go from polo shirts and slacks to Tripp pants and band tees. I'm my own walking style. I do, you rarely see the detail and style like this in any other form of modern art. The culture is growing and expanding more every day. Soon, tattoos will be the norm instead of being taboo. Every one of my Tattoos has a back story, the crosses are for my grandfathers, the bite marks were for a buddy who lost his life in a motorcycle accident, the raven is a tribute to an author who made it possible to be where I am today, the symbol on my fore arm is from a video game, and represents my nerd pride, and just being myself. The word "Pain" on my chest is another tribute to my grand father. He used to have a saying, "The weak hide their pain from the world, the strong wear it on their chest." The "Place Knife Here" piece is a long story, I will get to it later on. My favorite piece has got to be my Raven. I spent six hours in the chair for that bird, and it means so much to me. It represents the pain and struggles I had growing up. I live near the beach, and all of my ink is on my upper body, so yes, people stare a lot. Not many approach and ask though, but if they do, it's normally about my chest piece. They do when I'm getting them. When I am on the table, I feel the pain, but it shortly goes to numbness after an hour or two, then when they are finished, I can't help but smile because I made it through the worst. I have two. The crosses are definitely one of the most significant pieces I have. my grandfathers were my heroes, and they are the reason why I am in the Army today. I am rarely able to visit their gravesites, so I tattooed two large crosses, with their nicknames that I used to call them underneath. The second is my chest piece. 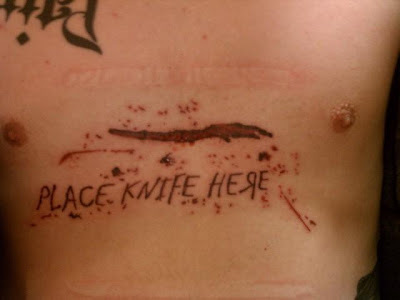 It says "Place Knife Here" and there is a large knife wound over it. When I was younger, I had a fiancée, and I was completely head over heels. She meant the world to me, and I thought it would last forever. She told me she was pregnant, and it lit up my world. I was going to be a father. After that, I got a phone call from one of my best friends. My fiancée had gotten an abortion, pawned the ring, and used the money to buy a plane ticket to California and to fund part of her wedding. It almost killed me inside, but instead of blowing up and going crazy, I took it in stride, even though it felt as if I had been stabbed dead center of my chest. My next tattoo will be adding on to the Edgar Allan Poe theme for my ribs. 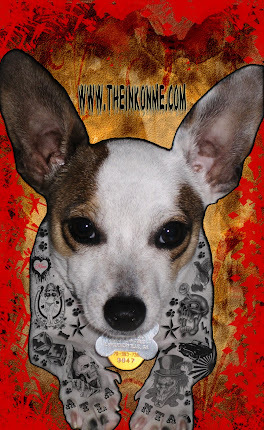 Going down the right side of my ribs I am going to have a large banner with the name Lenore inside of it. For a first tattoo, I suggest you pick something with a deep meaning. Do not regret it when it is finished. If you are going to have any doubts, have them before the artist begins. One thing life has taught me is that no matter what happens, you can ALWAYS stand back up. Love, like the coldest December, in the middle of winter, is bound to die if no one is there to stoke the fires. - Me. They say only the good die young, sounds good to me, who wants to live until they are ninety.